Have you ever wondered if it is truly possible to run pain and injury free? Do you yearn for the day that you will be able to enjoy the many benefits that running brings by running pain and injury free? Sadly, among many runners is an inherent yet often unspoken belief that it isn't possible to run pain and injury free. Many runners believe that if you run far enough and for long enough, injury will be the inevitable result. In You CAN Run Pain Free! 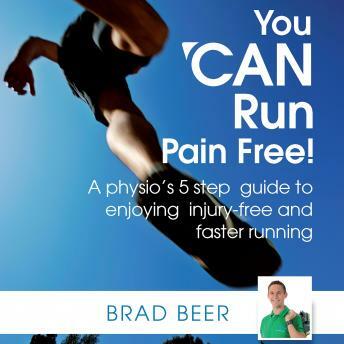 A physio's 5 step guide to enjoying injury-free and faster running readers will discover how to both prevent and overcome running injuries, and go on to enjoy new levels of exercise pain and injury free, and ultimately faster running. - is not concerned about injury prevention or rehabilitation but just wants to get faster. Brad Beer is a Gold Coast based physiotherapist. In 2006 Brad founded his first practice now known as POGO Physio. Brad himself has delivered in excess of 25,000 physiotherapy consultations. Recognised as a leading authority on running injury prevention and rehabilitation, Brad - himself an avid runner - is passionate about seeing people unlock their true physical potential and discover the many joys and benefits of running.